BIOMAXX CLASSIQUE GENTLE LOTION is a blend of carefully selected ingredients that moisturizes your hands as it cleans, maintaining a level of natural oils on the skin. It produces a luxurious lather that is easily rinsed, leaving your hands smooth and hydrated. 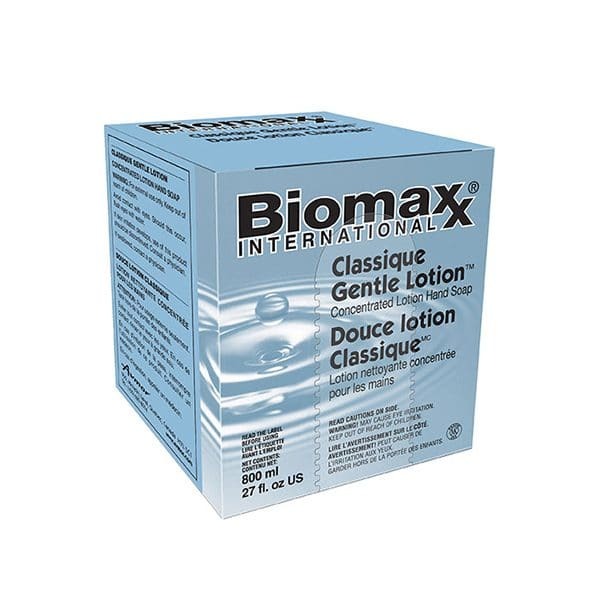 BIOMAXX CLASSIQUE GENTLE LOTION must be used with the Biomaxx soap dispenser, designed to fit with the bag-in-box system. Wet hands and forearms. Apply the lotion CLASSIQUE GENTLE LOTION to the skin. Rub briskly then rinse with water. For food premises, wet hands and forearms. Apply the lotion to the skin. Wash for one minute, then rinse thoroughly with water.